Today’s recipe is another delicious casserole that is so simple to make. 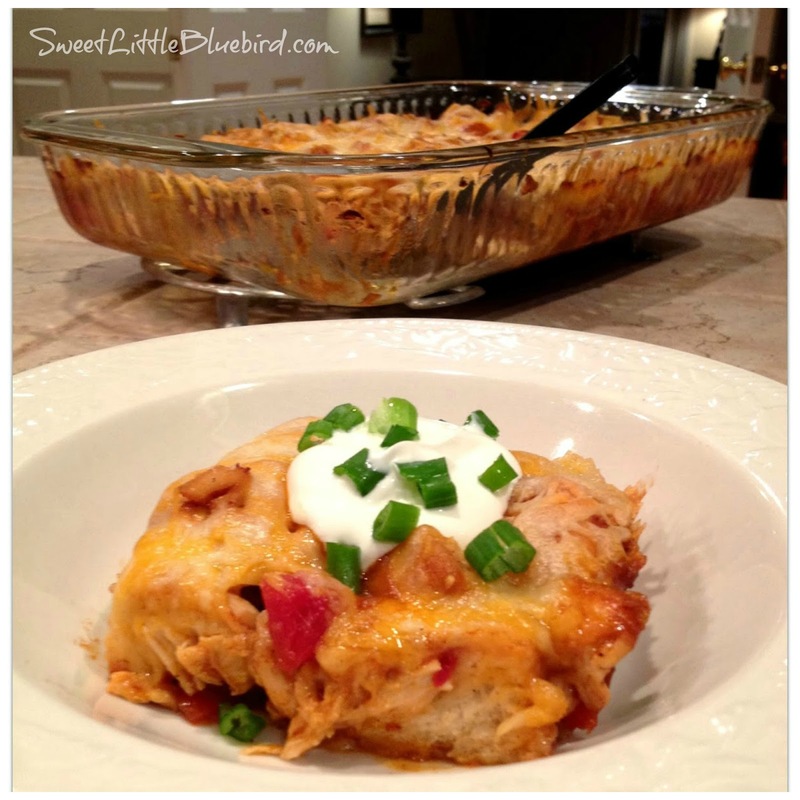 It’s a perfect meal for a busy week night – Bubble Up Mexican Casserole! Only five ingredients to make this yummy dish – chicken, refrigerator biscuits, enchilada sauce, Rotel (diced tomatoes and green chiles), topped with a Mexican cheese blend. Oh so good. My inspiration for the recipe came from the blog, Recipe Diaries’ Bubble Up Enchiladas – Weight Watchers Recipes. If you are looking for a great 10 points plus meal, head over and snag the recipe! Preheat oven to 350 degrees F. Spray a 9×13 baking dish with non-stick cooking spray. Cut biscuits into quarters and place them in a single layer in baking dish – see photos below. Heat chicken in a skillet on medium heat. I cooked my chicken breast in olive oil in a skillet on the stove. Pour enchilada sauce and rotel over cooked chicken and mix well. Pour chicken mixture evenly over biscuits. Bake on middle rack of oven for 25 minutes. After 25 minutes, use a toothpick to check to see if the biscuits are cooked through. When ready, remove from oven, evenly top with cheese and place back in oven for an additional 8 to 10 minutes, until cheese has melted and begins to bubble. Serve topped with your favorite toppings: sour cream, lettuce, onions, tomatoes, olives. Enjoy! Tip – black beans, corn and Jalapeños would make a great addition to this dish! Can you freeze this after baking it? Can u freeze this after cooking? You can Google a recipe for biscuits and make your own. I don't think scones are the same. Anything Mexican and I am in!! Looks wonderful Mary and hard to believe it's on the healthy side! Thank you! Thank you, Danni! I'll be making this again very soon! Sounds yummy. Can't wait to try. Off to buy some biscuits! Thanks for sharing. You're so welcome! Thanks so much for the visit! Yum Mexican food is my second favourite cuisine only after Greek this looks yum! You have good taste buds!